* This post appeared recently on the Culture on the Edge blog and is part of an on-going conversation on the scholarly use and meaning of the term “data.” Culture on the Edge also addressed this question here and here, as did the Bulletin blog, which can be found here and here. Case in point: what do you make of this recent segment from The Daily Show that was just making the rounds on the internet? Have the questions, demeaning eye rolls, and edits disrespected and abused that one gentleman’s agency and autonomy as a human being of inherent dignity and worth by making a laughing stock of him (he soon after was asked to resign from his political position, indicating the real-world impact of this interview)? Has this human being, this unique individual, lamentably been turned into an object, or worse: a mere commodity (for this is a television show, part of the mass-media, that uses advertiser’s dollars to make a profit for its network, after all — not unlike the presses that publish our own careful ethnographies and nuanced histories, but I digress…) — thereby turning a person into a thing that we use for our own entertainment and edification (and don’t forget profit)? If that’s the way we see it, then where is the public outcry from scholars over his, what shall we call it, deplorable and dehumanizing treatment at the hands of the media? 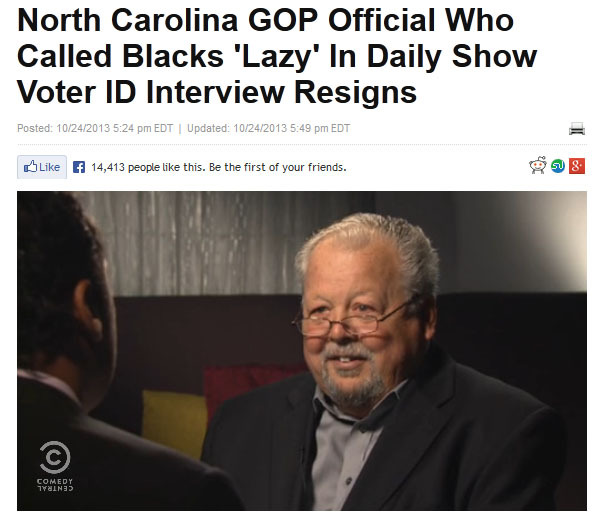 My hunch is that, depending on your political view, you may well feel like the parody news reporter nailed this cocky fellow just about right by exposing the hidden, improper, even racist motives that, some would argue, drive such things as voter registration efforts in some U.S. states. We’re not here to protect and honor him but to out him. Am I right, or I am right…? So my (loaded) question is: What acrobatics and self-involved hand-wringing will those (at least left-leaning) scholars who worry so much about the objectification and loss of “the human” need to employ to rationalize why either some or many of them probably laugh or feel vindicated while voyeuristically watching a segment such as this, while watching parts of this man’s life fall apart before our very eyes? What’s more, now that we’re on the topic of protecting or recovering or preserving or conveying “the human,” how much must such scholars eviscerate the particulars, gaps, and contradictions of social, historical existence in order to come up with some generically trans-species status, apparently shared by all of us (but only us, and just us — not that guy), called “the human”? Ever read Roland Barthes on this (PDF)? Put briskly: What are we protecting from the word “data,” when we bristle at its use in the human sciences, other than our own uncontested right, as privileged writers and readers, to define what counts as the core traits of a universal group to which we also happen to claim membership? This entry was posted in Politics and Religion, Religion and Popular Culture, Religion and Society, Religion and Theory, Religion in the News, Theory and Method, Theory in the Real World and tagged Roland Barthes, Russell McCutcheon, The Daily Show. Bookmark the permalink. You ARE right, Prof. McCutcheon. I was just mulling over the troubling degree of homogeneity of thought at the “academy,” and the assumption that academics all support a single obviously true political POV, accompanied by an equally obvious moral code, one that leans “left,” “green,” “inclusive,” etc. If you dare to contest any of these truths, beware: resistance is futile; you will be assimilated. At just that moment, opening my e-bulletin, I read your piece and it really resonates. It seems this hegemony of political and moral correctness extends as well to those subjects deemed worthy of scholarly concern and protection, and those who do not. This sounds like a carefully hidden “you’re not tolerating my intolerance” message.